As tasty as it sounds, Strawberry Sour Diesel does it like no other strain can. Combining the Original Sour Diesel with the Strawberry Cough (bred by Kyle Kushman), she emerges as a potent powerhouse packed full of juicy flavors. An intense hybrid to say the least, she is well-loved by cannabis connoisseurs and intrepid growers alike. Ready to harvest after just 9 weeks of flowering, Strawberry Sour Diesel brings a hearty batch of super strong buds to the table. Buds that are rock hard and oozing with resin. Expect to receive exceptionally high yields for relatively light work. In terms of the smoke, Strawberry Sour Diesel is one of deep authentic flavor. Nestled among all of that old-school Kush are an assortment of beautiful berries, the most notable of which being strawberry (if you hadn't already guessed). Once inhaled, she induces an awesome high, one of sheer weightlessness. 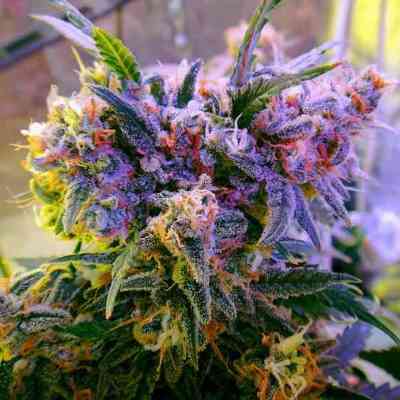 She is the perfect strain to share among friends or for simply unwinding after a long day.